The D Train introduces the most aggravating character imaginable, then forces you to spend 97 minutes with him. 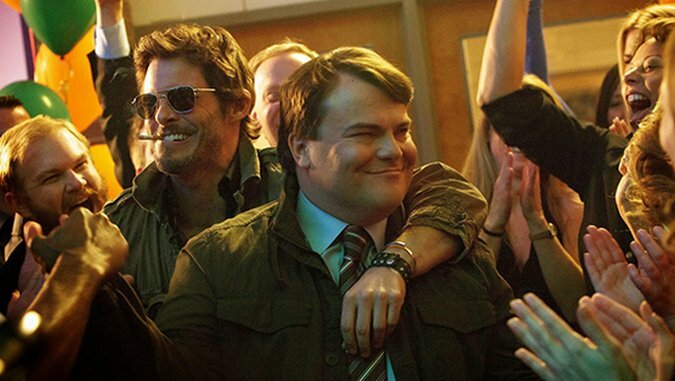 It’s the kind of gambit that could lead to some ingenious social satire, but little ingenuity is on display: Writer-directors Andrew Mogel and Jarrad Paul only ask Jack Black to carry the movie, giving him a role that’s all build-up and no climax. Dan Landsman (Black) is a limp, ineffectual loser whom nobody likes, and it’s easy to see why. He lies, he’s needy, he’s no fun to be around; the surprise of his existence isn’t that he has no friends—because of course he doesn’t—but that his wife Stacey (Kathryn Hahn) still hasn’t left him after years of marriage. In contrast to the archetypical aged jock who yearns to return to his high-school glory, Dan longs for glory he never had, consistently attempting to rewrite history, presenting himself as the beloved friend no one ever wanted. He fabricates nicknames with his first initial (see the movie’s title), hoping one day people will start using them, and, more than that, believe they always did. It’s a sad series of delusions this character harbors, but none at all uncommon amongst films of this stripe. Dan is on his high-school reunion committee with a few other people who go out of their way not to invite him to the bar after meetings. He seems destined to live out his life as a non-entity—until he sees a sunscreen ad on TV and gets an idea. The spokesman in the commercial is none other than Oliver Lawless (James Marsden), at one time the most popular guy in Dan’s reuniting class. After seeing the ad, Dan determines that his classmate has hit the big time, that his being in a Banana Boat commercial puts Oliver on the same level as someone like Tom Cruise—which in itself is a stretch, not on the part of the character, but more on the part of the screenwriters, who by this point only seem to pile delusion upon delusion without much sense of the character beneath it all. Dan decides that the struggling reunion would become a must-attend social event if the celebrity RSVPs, and that if Dan is the one to make such a miracle happen, everyone would hail him as a hero. The best comedy always comes from pushing limits—of taste, tradition, manners, patience, plausibility—but without a sense of what those boundaries even are, the humor has no foundation from which to push. Buster Keaton’s guideline holds true: a gag didn’t have to be plausible, but it had to be possible. Dan’s interactions with all of his supporting characters are just … impossible. Take the web of lies that Dan spins around his boss (Jeffrey Tambor). He fabricates a story about a potential client in Los Angeles to expense a trip to lure Oliver to the reunion. The joke is that the boss isn’t tech savvy, and thus Dan can tell him ridiculous lies, such as: You can’t CC someone new in on an email once the thread has been started. The concept isn’t a bad one, but the writing never convinces us that the ruse would actually work. As the supposed deal nears completion, Dan never has to provide anything but vague buzzwords. No sweat is generated to maintain the charade. The only moment in this grand deception that has any sense of excitement comes once Oliver enters the story, and helps Dan make a fool out of his boss. Oliver ends up treating the deception like a role in his improv class, and Marsden adds an unhinged spontaneity that the rest of the movie painfully lacks. If the absence of suspense weren’t enough of a drain, Dan generates no sympathy or support, even when he’s supposed to. There may be some unlikable characters that the audience still wants to see succeed in a weirdly perverted way, but the D-Train is not one of them. Granted, there has been some buzz about a “surprise” scene in this film, and it’s not perverted by any means—but the film’s sense of what “success” actually means is, well, off. Dan’s deviousness isn’t as wily or clever as the film wants it to be, so we’re left with a character that’s not funny enough, clever enough or awful enough to deserve our attention. He is annoying, though, which seems to be, as far as the filmmakers’ are concerned, their biggest success.